An earlier version of this post originally appeared on the History News Network in late January. Toronto Mayor Rob Ford sure is in the news a lot these days. In late December, the US liberal-leaning Talking Points Memo website announced it had awarded him their annual scandal-of-the-year trophy, marking the first time this infamous recognition went to a politician outside the United States. And in January another video appeared of a seemingly drunken, incoherent Ford ranting in a fake (and, many have argued, offensive) Jamaican patois at a local fast food restaurant. Like the previous videos, Ford’s antics were once again broadcast and mocked on American late night television for a global audience. Ford, who had previously told the media that he had sworn off alcohol, admitted that he’d been drinking “a little bit” that evening. Despite Ford’s seeming non-stop substance abuse sideshow, polling numbers show Ford’s continued support from a core of Torontonians. The city’s residents will go to the polls later this year, so we’re bound to hear much more about Ford throughout his re-election campaign. So how did Toronto get here? Rob Ford rose to power in 2010 with a populist right-wing platform of low taxes. With memory of a month-long garbage strike during the previous summer still fresh in many voters’ minds, Ford took advantage of anti-union and small government sentiment with simple but effective campaign slogans. He guaranteed “Respect for Taxpayers” and to “Stop the Gravy Train” of wasteful spending. And he promised to end the “War on the Car,” which he claimed had taken place when the previous mayor, David Miller (who did not seek a third term in 2010), pushed for a network of light rail transit lines in areas with poor transit service. On election night, the wealthy councillor from suburban Etobicoke won the mayoralty with almost half the vote, more than 10 percent higher than his closest competitor. Since then, pundits have sought to explain his surprising victory and continued support. Whereas few fans of Ford reside in the inner city, his winning campaign appealed to many residents of Toronto’s inner suburbs who believed they had felt the pinch of rising taxes under Miller without a corresponding improvement in municipal services. Geographer Zach Taylor used polling station areas and census tracts in Toronto to create a fascinating mapped analysis of the election results. His conclusion? Sure, Ford’s base live in the suburbs. But what’s particularly important, Taylor’s maps show, is that his support came from diverse areas. 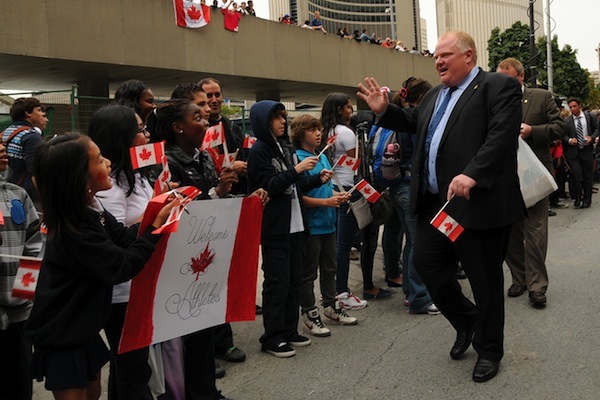 Not only had affluent and middle class white suburban voters bought Ford’s conservative message; so too had suburban neighbourhoods home to the less affluent — often first-generation immigrants and visible minorities. Taylor’s work underlines how the politics of place — sentiments of resentment, exclusion, and social isolation felt by suburbanites of varied backgrounds towards the city’s status quo — determined the 2010 election. It also offers a key lesson for progressives in Toronto who must seek a winning formula if Ford is to be unseated in October. A successful progressive candidate must appeal not only to the left-leaning inner-city vote, but also to suburban residents who have been excluded from the fruits of Toronto’s booming economy. Most of all, the Fordian political saga further reinforces the problem of stereotyping “suburbia” as a homogenous entity, a narrative that Canadian urban scholars have recently been complicating. The relationship between city and suburb in Toronto has evolved over many decades. During the late nineteenth and early twentieth centuries, the City of Toronto annexed numerous districts along its urban fringe. This trend ceased by the 1920s because of cost concerns about servicing outlying areas, yet suburban expansion continued. By the early 1950s, haphazard and rampant suburban development in nearby townships outside of the city prompted the Province of Ontario to create the Municipality of Metropolitan Toronto in 1953 (known as “Metro”), the first truly federated municipality in North America. Within the Metro system, councils of the City of Toronto and surrounding suburbs continued to govern local matters, while a second tier of government took care of larger jurisdictions such as regional planning, infrastructure development, and eventually some social services. Diverse landscapes existed within Metro. The city had grown since the late eighteenth century with high residential densities and, by the late nineteenth century, a web of public transit lines. In contrast, postwar Metro suburbs — North York, Scarborough, and Ford’s Etobicoke — developed at lower densities designed for the car. For the most part, the Metro system successfully balanced the needs of the inner city and its suburbs, although disputes over transportation matters — particularly the need for expressways by the 1960s — showed a clear city-suburb divide. The arrangement ended in 1998, when the provincial government forced amalgamation on the Metro municipalities and thus created what is called the “Megacity” of Toronto. With a population of almost three million people, Toronto is now the fourth-largest city in North America. Critics believe that the right-leaning provincial government rammed through the reform in order to weaken progressives who formed a strong rump in the old city. No matter the reason, the old city and inner suburbs became a single political entity (though a number of “outer” suburbs have developed beyond the Metro/Megacity border, particularly since the 1970s). Over the lifespan of Metro, numerous factors helped create a socially-diverse suburban landscape. As early as 1959 Metro planners sought to increase density in the growing suburbs in order to improve the efficiency of municipal service provision, especially public transit (despite the dominance of the car in Metro suburbs, these areas enjoyed the expansion of bus service and in some districts even subway access). One result is Toronto’s remarkable number of high-rise apartments that dot the suburban landscape, typically near major roads. These slab towers — private rentals and public housing — often exist close to the more typical residential building style associated with postwar suburbia: detached homes. Within the past four decades a majority of immigrants began to favour settlement in Toronto’s suburbs rather than the traditional reception areas in the inner city. During the 1970s, a majority of Metro’s poor neighborhoods were found in the inner city, but downtown Toronto has largely gentrified since that time — with corresponding increases in rents and property values. On the flipside, rents in suburban slab apartments are relatively affordable. Multigenerational immigrant families also have found living in suburban homes as an affordable strategy for their household economy. Three years before Ford’s election, David Hulchanski authored the Three Cities report, which argued that the increasing cost of living downtown, the rise of part-time and temporary jobs, and the decline of the welfare state have all led to the growing income disparity between the old City of Toronto and the inner suburbs. Many of the same factors exist in other major Canadian cities, particularly Vancouver and Montreal. In Toronto, awareness of demographic change in its suburbs has existed since at least 1979, when Metro’s Social Planning Council observed in these areas “the introduction of central area diversity”: an increase in the unemployed, new immigrant households, and single-parent families, and other groups typically unassociated with postwar suburbia. At the federal level, minorities have traditionally been associated with the centrist Liberal Party or in some cases the left-leaning NDP. There are signs that this trend is changing. Prime Minister Stephen Harper’s strategy of attracting mostly middle-class ethnic voters in the newer suburbs outside of the Megacity to support Conservative Party candidates helped give him a majority government in the 2011 federal election. Yet it is difficult to directly link trends at the federal level with municipal politics in Toronto. For one, many ridings home to Rob Ford’s suburban base failed to elect Conservative politicians in the most recent federal and provincial elections. And the tenor of Canadian municipal politics is different than its bigger siblings: an official party system does not exist and incumbents enjoy high re-election rates. We lack hard data on the percentage of less affluent and ethnic minority Torontonians who voted for Ford or continue to support him, as accessible exit polls from the 2010 election or more recent opinion polls fail to provide demographic breakdowns. But Ford’s former ward when he was a councilor (now served by his brother Doug), offers clues. Ward 2, located in northwest Toronto, is home to a higher percentage of visible minorities and first-generation immigrants, as well as a lower average household income, than Toronto as a whole. More than 60 percent of voters in the ward supported Ford in 2010 instead of more moderate or left-leaning alternatives. Similar demographics exist for Ward 42, located at the other side of the Megacity in suburban Scarborough and home to the “priority neighborhood” of Malvern: almost 90 percent of residents are visible minorities and average household income is lower than the Toronto average. Here, too, Ford received the most votes. As noted, the mayor also enjoyed victories in affluent suburban areas; the exclusive Bridal Path neighbourhood and wealthy districts in southcentral Etobicoke to name a few. But the point remains: Toronto’s inner suburbs voted for Ford en masse and are home to diverse groups of people, many of whom are not typically associated as right-wing voters. Toronto’s recent history is not the first time Canada’s suburbs have been marked by social diversity. In fact, historical geographer Richard Harris argues that diversity was the defining characteristic of Canada’s suburban development during the first half of the twentieth century. During this era, the suburban landscape consisted of affluent enclaves, unplanned and industrial suburbs home to the working-class, and speculative middle-class developments. By 1960, however, reforms by the federal government in the field of mortgage finance led to the rise of large-scale land developers and a subsequent “creeping conformity” of a middle-class consumerist lifestyle in Canadian suburbs. Yet the recent Toronto case suggests a re-emerging trend of social diversity in Canada’s suburbs. With Toronto’s mayoral election approaching, communicating why the benefits of progressive policies are in the interest of less affluent voters in inner suburbs — where improved services are in greatest need — holds the key to victory. Jay Young is a SSHRC postdoctoral fellow in the history department at McMaster University and an editor of ActiveHistory.ca. He is currently revising his doctoral dissertation on the history of the Toronto subway system for publication.